No. 1/2in, No.2 3/8in, No.6 3/8in, No.8 1/2in, No.10 1/4in, No.11 1/8in, No.39 1/4in and as the work becomes more ambitious, add No.3 5/8in, No.5 3/4in, No.10 5/8in and No.11 3/8in. Many good quality modern tools, such as Swiss tools, now have the addition of metals such as vanadium and chromium to the steel, giving a tougher edge and more rust resistance. Modern tools are hardened to a Rockwell standard of between 58-61. The manufacturer's name and the number referring to the curvature of the edge are often stamped where the steel shaft fits into the handle, just below the swelling in the shaft called the bolster, although this is not always the case. In the Sheffield list, straight-shafted tools are listed with the number 1 for flat chisels. 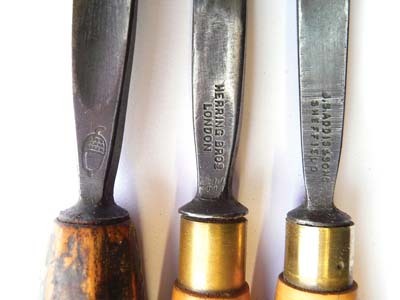 Gouges are listed from number 2 which is very shallow, to number 11 which is very deep. 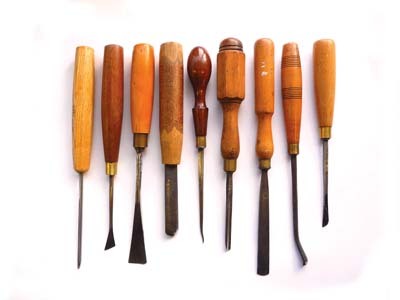 Chisels with small widths are referred to as veiners - used for carving leaf veins - and in the larger sizes referred to as fluters. Some tools are made with a tapering shaft and are called pods or allongees, when the taper is along the whole length of the shaft. If the shaft is fairly parallel and fans out at the end, then they are called fishtails. These are lighter tools than the straight sided gouges and really should only be used with very light mallet work. Tool manufacturers supply tools with a variety of patterns, quality and timbers. 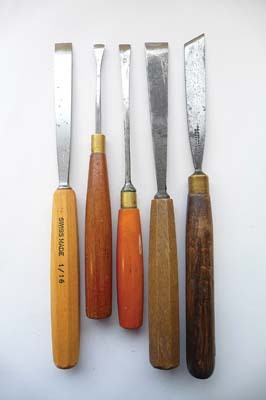 Photo 7 shows the variation of handles typically found on gouges. 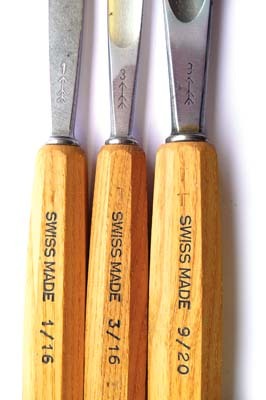 From left: Swiss tool octagonal, best carving pattern in beech, best carving pattern in boxwood, Hazel branch, ladies or amateurs, best London octagonal boxwood, best round beech, best carving pattern, and firmer type. If ever you need to fit a new handle, start by wrapping the cutting edge of the tool with tape to prevent accidents and after removing the old handle, clean any rust or debris from the tang of the tool using coarse abrasive wrapped around scrap wood (see photo 8). Next, make sure the diameter of the hole in the handle is about the same measurement as half way down the tang (see photo 9). Hold the chisel shaft wrapped with cardboard to prevent it being scratched in a vice, lower the handle onto the tang and gently tap it on. Rotate the handle so that it reams a hole, and continue gentle tapping and twisting until the ferrule is within 3mm (1/8in) of the bolster. Then tap the handle firmly into place (see photo 10). For beginners in woodcarving, the main questions are how to use the tools and which tools should be used for specific activities. 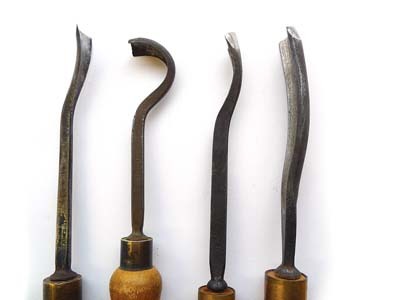 Gouges, which means any tool with a curved cutting edge of one sort or another, are used most of the time. 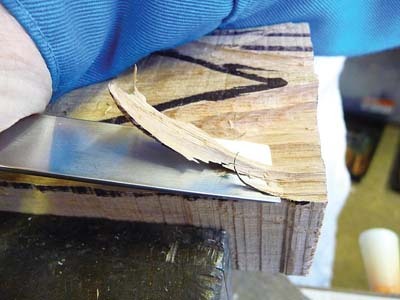 The gouge is held like a dagger in either hand, and the cut is made by gripping and pushing the handle with the other hand and slicing the wood with the sharp chisel edge. Holding the sweep correctly, the heel of the lower hand pivots on the surface of the wood (see photo 11). A less controlled cut will result from not having the lower hand in contact with the wood being worked on. 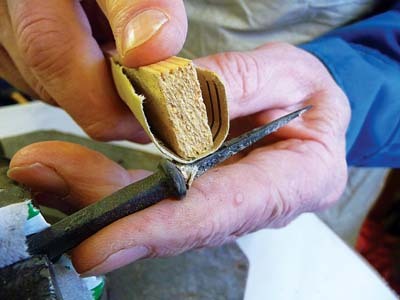 The alternative way to use the chisel is when the cut is assisted with a mallet blow. 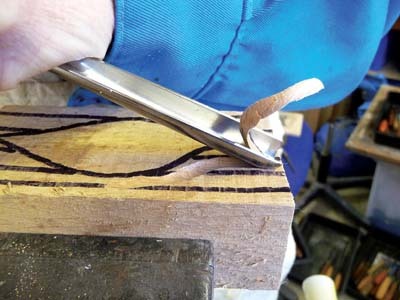 The cut is made with one hand holding the chisel handle and with gentle taps from the mallet on the end of the handle, a controlled cut can be made. 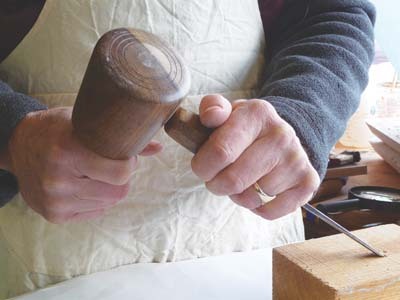 A woodcarver's mallet is cylindrical so that when it is being used, the mallet face gives a consistent striking blow without the carver having to look at it, so full attention can be paid to the chisel's cutting edge. 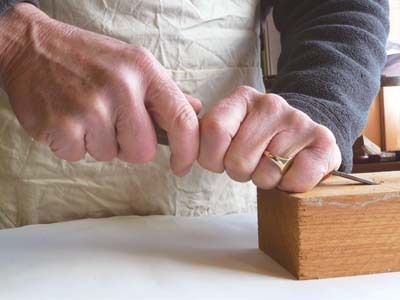 When you are using a mallet, it is a good idea to grip the chisel handle with your thumb next to your index finger, rather than wrapped around the chisel handle so that if you miss hit the end of the chisel handle, your thumb does not get hit by the mallet (see photo 12). When the thumb is wrapped around the chisel handle, a miss hit can be painful. Shop-made one-piece mallets are much cheaper than two-piece types, work just as well, and the head won't come loose. Generally, 75-100mm (3-4in) in size is perfectly adequate for medium-sized work. 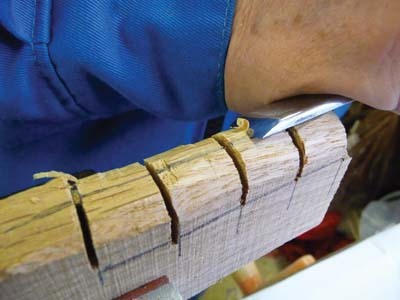 When carving timber, particular attention must be paid to the direction of the wood grain - the result of long cells which grow in alignment with the long axis of the trunk and branches. Driving a chisel into the end of the grain will cause these cells (grain) to split. Cuts may be made across the long direction of the grain, at an oblique angle along the grain, or even at right angles to the grain. Problems occur when the chisel makes a cut that creates a split along the grain. 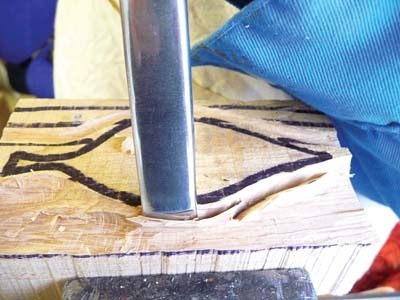 By making a cut that follows the grain, it is possible that the wood will split. In order to avoid this from happening (see photo 13), it is better to cut so that the gouge is working 'downhill' across the length of the grain. 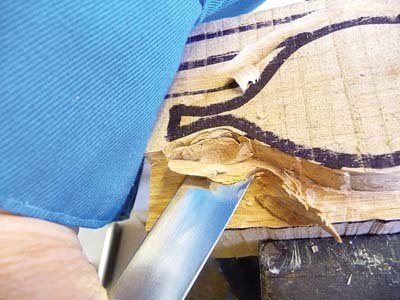 By making a 'stop cut' with a saw, the wood cannot split where the pattern being carved rises against the grain (see photo 14). (in cannel) is facing upwards as wood is cut away. 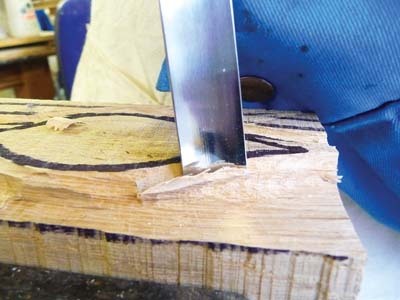 When using a gouge, it is important that the outer corners of the blade do not go under the surface of the timber - this is because firstly the corner is likely to be broken off and secondly, if the wood is not being cut cleanly, it is much more likely to split. 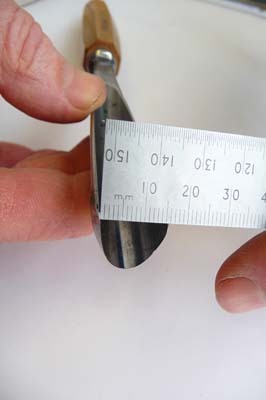 Photo 15 shows the correct depth to sink the edge of a tool so that the sides cut cleanly. Removing the bulk of waste wood from a carving is called roughing out and is almost exclusively carried out with gouges of varying sweeps. a relieving cut around the main shape, allowing easier removal of the marked waste wood. 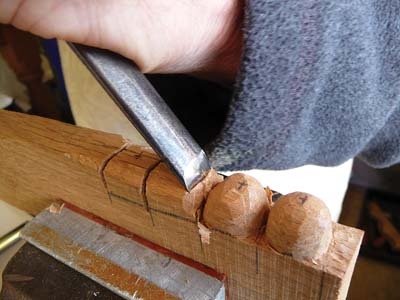 This stage is carried out with a deep No.11 or similar straight gouge and mallet, steering the gouge around the shape, paying attention to grain direction and removing the waste down to the line (see photo 16). The deep gouge leaves quite coarse marks and these can be reduced by taking off shavings with a flatter (e.g. 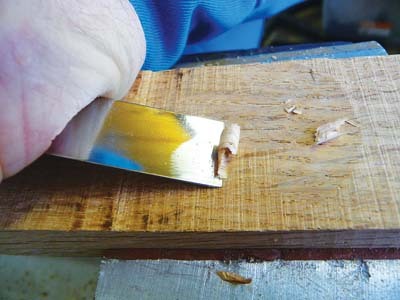 No.3) gouge, leaving a smoother surface (see photo 17). After the bulk of the waste has been removed, it is time to define the shape. Using the gouge in a vertical position, take off shavings down to the ground level. 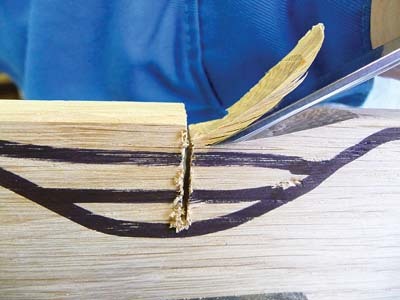 Remove wood back to the marked line using whichever gouge's curvature fits each part of the profile of the shape accurately. 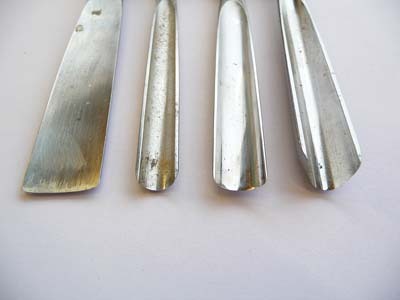 Importantly, gouges can be used so that either the concave or convex face is following the shape. 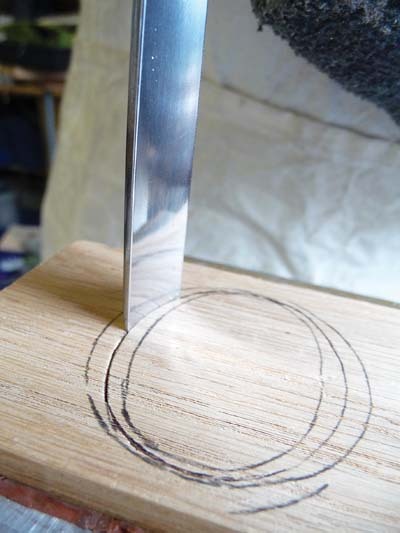 Another important function of the curved shape of the gouge's cutting edge is when it is used hollow side downwards to form convex shapes, such as balls on mouldings. 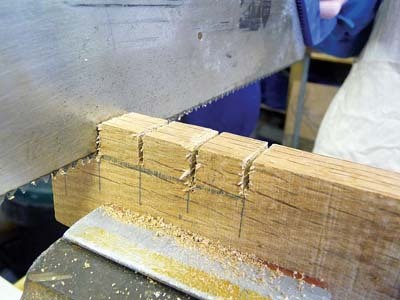 The wood is prepared by marking off square shapes that will accommodate the size of ball to be made, and then relief saw cuts are made to the correct depth (see photo 21). 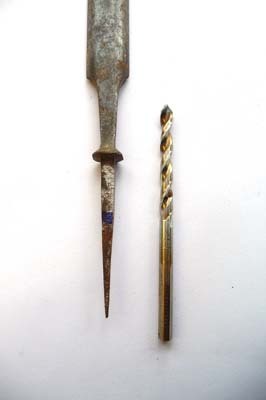 The top edge of the wood is then shaped to a half round section using the inside face of a gouge (see photo 22). 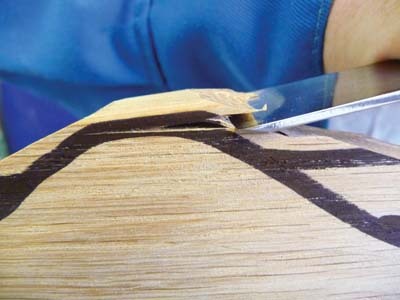 of the ball to be carved, shape it by taking off manageable sized shavings until the ball is formed (see photo 23). Sometimes only small amounts of wood need to be removed to produce a carving e.g. letter cutting. 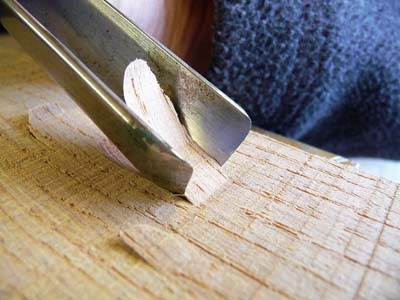 In order to do this, simply cutting across the wood grain before attempting to take an angled cut will allow a chip of wood to fall out, and splitting the grain will be avoided. 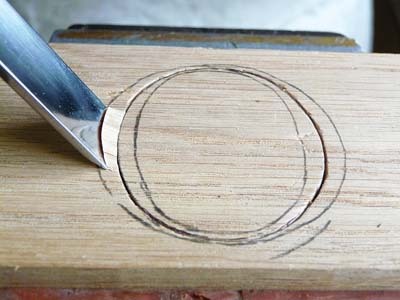 The letter O is marked out and only the wood within the letter shape needs to be removed. Using various gouges with curvatures that fit the centreline of the letter shape, make mallet assisted vertical cuts all along the centerline (see photo 24). 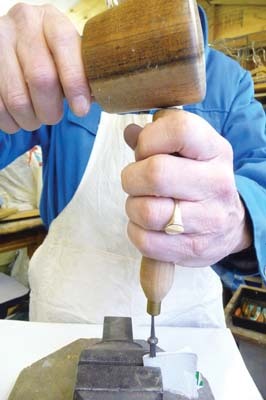 Holding a gouge that exactly fits the outside shape of the letter at 45 degrees, gently tap the chisel handle. The chip should pop out and if it does not, then set in again gently and repeat the angled cut (see photo 25). Tidying the cut is best done with the two-handed carving technique. Cutting the inside shape requires a specially shaped gouge with a round cutting edge, which will be studied in a later article. In order to produce a fairly smooth surface that will not need sanding, use a very sharp shallow sweep, e.g. No.2 or 3 held at a low angle, and cut with a forward slicing action. This is a most effective finish that catches the light and shows that the piece has been hand carved. tool manufacturers, mainly based in Sheffield. Thus the Sheffield List set the standard shapes and nomenclature for all carving tools made in the UK.